Home » About Media » Books » Graphic Novel » The Hills are Alive with…Zombies? October 31st, 2010 was a historical television moment. For the first time, a television series was brought to the small screen based on those loveable, flesh-eaters we refer to as zombies. Enter the new AMC series, “The Walking Dead”. 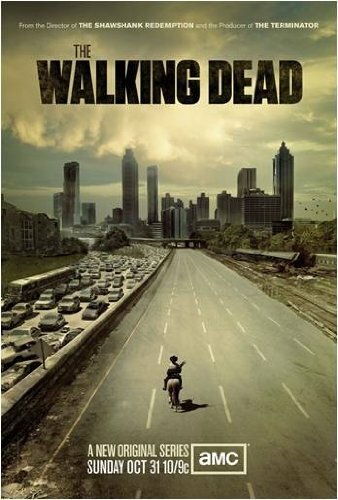 This six episode season, based on a graphic novel by Robert Kirkman, follows a small group of survivors outside Atlanta, Georgia as they attempt to find some hope after the world has been overtaken by the ever-hungry living dead. Their survival depends on not only out lasting the foot-dragging zombies but also holding on to their humanity as the world they know is turned upside-down. This is not your average horror movie, (though the makeup team pushes the envelope to get the feel of the graphic novel) but a character-driven story line that brings philosophical questions to the audience. How would you act if you woke up one morning and the world as you know it had been transformed into Chez Zombie and you are the main dish? AMC brings zombies to your livingroom. What is our fascination with the zombie lore? These mindless, representations of our more basic selves seem to be present throughout history in folklore and fantasy. It took a vision of George Romero in his 1969 movie “Night of the Living Dead” to bring the modern mythology to life as we now know it. His movie showed the base of how we now view the living dead; the continuously hungry, slow-moving lesser part of the used-to-be-human race. Could this be an analogy of our fears of what we could become if all of our morals and conscious were removed? In most modern mythology, the world ends with an infectious virus that causes death and then reanimation. Only a small group survives and fight against all hope of having what is seen as the essence of humanity. The setting is a place where the dead, or not so dead, walk the earth without a belief in anything except for their need to satisfy their craving for food, in this case, living flesh. In most of these stories, the only way to kill the undead is trauma to the brain. Most prefer the single shot from a Dirty Harry sized weapon. This begs the question: does everyone become a crack shot once the world ends? The renewed craze in everything zombie has also had a few positive impacts on the real world. Organizations like the Zombie Squad have been popping up chapters across the country. They combine the fun and appeal of the zombie apocalypse with disaster preparation. The organization uses the fictitious (or is it?) end-of-the-world scenario as a springboard to educate communities on the importance of preparation for natural disasters. Their idea is that if one is prepared for an attack of killer zombies then they will be prepared for anything that might come along. I feel a little safer with the Zombie Squad patrolling my neighborhood, how about you? Though vampires are all the rage these days, zombies bring more social reflection than the recent sparkling blood-sucker box office hits. It questions our society, the need to survive, and what makes us human. Part of our desire to connect with this unlikely foe is our need to belong to something larger, a need to feel emotionally connected to world around us. If you are worried on how to survive, maybe some research is needed. One recommendation is to watch Zombieland (2009) for helpful hints and 32 rules, such as #4: Doubletap. You won’t be disappointed. 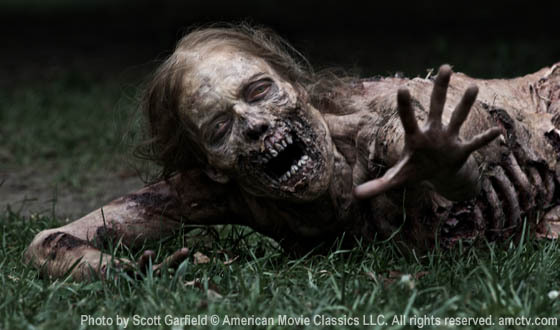 Catch AMC’s “The Walking Dead” Sundays at 10 p.m. Whether you are a fan of the genre or just a passing observer, this dramatic adaptation of The Walking Dead is something to check out. The story draws you in, the cast makes you want to root for the living, and the effects feel like a big screen movie. Catch the first season Sunday nights at 10 pm on AMC network. What are your favorite zombie movie moments? Over the next few weeks, I will delve into some of the zombie movies and mythology. Why? Because nothing can be as much fun as a mindless, undead eating machine. 4 Comments on The Hills are Alive with…Zombies? Nicely written. When I read your posts I always wonder why when we younger that you didn’t write a book or two. You have a great deal of talent and it is a pleasure to read you. Thank you for your comments. I am not sure that I would have been able to write when I was younger. I am still trying to learn how to do things now. It is a learning process. The hardest part is coming up with something to say and when you do, getting it out on to the screen. I believe the original intent of zombie as a metaphor was to satire the decline of society as we became a more consumer driven society, mindlessly going through life. I feel the public’s fascination is more based on their attempts to reconcile their inner sense of powerlessness with a loss of control in their life. Be it rampant radical protests in the 60s or rampant intrusion of government now, the public sees themselves as the last survivors fighting the mindless around them. The movies allow them a chance to explore their feelings at arms length. I’m not sure that I have a favorite zombie movie, but for sheer fun, the “Pinkeye” episode of South Park has some fun with the Zombie genre. And while not a “true” zombie movie, but in a similar vein, “I am Legend” disturbed me, and not just for how the ending was bastardized and changes. Hey, the next zombie movie could be that the zombies develop a taste for fast food, and we can see them mindlessly waiting in line for Happy Meals muttering “toys …, toys … ” The government task force could come in and legislate the zombies out of existence. It also dovetails nicely with your previous post.